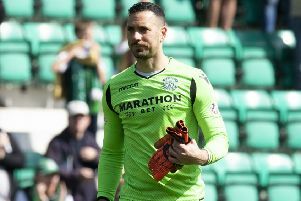 Martin Boyle believes Kris Commons has already played his part in Hibs’ Championship title bid – but he wants the midfielder to hang around and the finish the job. The Celtic star’s 28-day emergency loan ends after tomorrow’s match against Dumbarton and, although boss Neil Lennon would like to see the 33-year-old stay until the end of the season, he conceded the length of such a deal would be “a question of finance”. Cummings earned the club a hard-fought victory over Falkirk after they had stalled with draws against Morton and Raith Rovers, his late, stunning free-kick returning Lennon’s players to the top of the table. And they tightened their grip on that position, opening up a four-point lead, by following up that win against the Bairns by crushing their closest rivals Dundee United 3-0. Now, revealed Boyle, he and his team-mates are desperately hoping Hibs and Celtic can reach an agreement which would allow Commons to remain in Edinburgh. He said: “Obviously, we are keen to see Kris stay. He’s been a great character around the dressing-room. “He has the experience, he’s played for Scotland and in the Champions League but hasn’t even mentioned that. “He’s down to earth, brilliant and helped the younger boys like myself and Jason Cummings. Kris had that big impact in the win against Falkirk. He is capable of finding you when you make a run, scoring a wonder goal as he did that day or finding that little bit of magic that has everyone raving. “He’s an exciting player and hopefully the clubs can agree and he stays to the end of the season and helps us get promotion. If a question mark remains over Commons’ immediate future, Lennon’s latest signing, former Motherwell winger Chris Humphrey, has already endeared himself to the fans with a superb debut as he set up Cummings for Hibs’ first two goals against United. As someone who isn’t short of pace himself, Boyle fully appreciates the speed of Humphrey although, so far, the pair have resisted the temptation to go head-to-head in a sprint and instead concentrate on terrorising opposition full-backs. Lennon rolled back the years to field the two wingers against United, a tactic rarely seen nowadays, and was rewarded with what he described as the best team performance he’d seen since arriving at Easter Road last summer. Boyle said: “Chris is lightning quick and added a bit of oomph to the team, and an excitement factor for the fans. I do remember coming on as a sub for Dundee at Dens when we were 2-0 down to Motherwell. Chris got on the ball and I was trying to track him back – but he was off. “He has brought real excitement to the team. It was great for both of us the other night, getting loads of the ball and taking people on. Boyle admitted Lennon may have to tinker with his approach tomorrow as Hibs go from playing in front of a near sell-out crowd under the lights to the less-than-welcoming environment of the Cheaper Insurance Direct Stadium with it’s one stand and smaller pitch. But, he revealed, it’s something that’s been planned for on the training pitches at East Mains. He said: “We’ve been training all week and having brought the pitch in to make it tighter we know what to expect. It’s going to be totally different and it will probably be a howling gale because of the three open sides. They’ll be in our faces, we won’t get time on the ball, a bit like Cappielow and Palmerston Park, but we have to adapt, make our own space. We might have to be patient to unlock the door or get a ‘worldy’ goal. Boyle accepted Dumbarton won’t win the title – Stevie Aitken’s side more intent on retaining their Championship status – but insisted they can have a say on it’s ultimate destination having beaten United twice on their own turf this season. And, like the rest of his team-mates, he’s painfully aware that Hibs themselves were beaten 3-2 in Dumbarton last season. He said: “They are a big, strong, physical team. They will make it tough but we are top of the league and won’t fear anything. “Anyone can beat anyone in this league and that’s what makes it so tough. All we can do is keep winning. “We’ve had two hard games recently and it will get harder but we have strength in depth. You can see how strong the squad is with the likes of John McGinn coming off and scoring as he did. Former Hearts striker Christian Nade has joined Dumbarton for a second spell, Boyle noting how he has “given Hibs a few nightmares” in the past but dismissing the Frenchman’s “5-1” gesture as he walked past the away fans having been substituted in that 3-2 defeat. The 23-year-old said: “As players we weren’t aware of it as we were concentrating on getting back into the game. There’s been a few people doing it this season but they just need to let it go. To be honest, it’s a bit boring. “The fans react and sometimes things like that in the game work, people get distracted. Christian seemed to deliberately go round in front of the Hibs fans. “That’s a dangerous game, but he’s a big boy. Each to their own. “We’ve all done something stupid but it wouldn’t surprise me if he does it again to gee up our fans.